Esther Kinsky was born in 1956 in Engelskirchen, near Bonn, where she studied both English Languages and Literature and Slavic Philology. 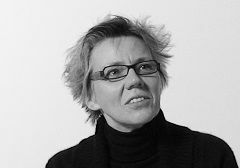 Since 1986 she has translated literary works from Polish, Russian and English, and has translated the works of Hanna Krall, Zygmunt Haupt, Aleksander Wat, Magdalena Tulli and Olga Tokarczuk, among others. She has described the challenge of mining the delicate boundary between one’s own and others’ words, and thus also one’s own life and the lives of others, in the essay »Fremdsprechen« (tr. Speaking foreign). Kinsky also writes poetry and short prose texts, which have been published in different literary journals in England, where she lived for many years. She had her breakthrough as a writer in 2009 with her first novel »Sommerfrische« (Eng. »Summer Resort«, 2011). In addition to being highly and widely acclaimed as a literary translator, she was praised as a literary discovery. Her début was written with the support of a grant from the Robert-Bosch-Foundation, which made research travels in the border regions of Hungary, Romania and Serbia possible. »Sommerfrische« tells the story of a woman who »intrudes« into the everyday life of a Hungarian village. The events experienced by the woman and individual villagers are embedded in detailed and lyrical still lifes and landscape descriptions. »Kinsky […] sings of this terra incognita in a language that is as inventive as it is beguiling« (»Neue Bücher«, NDR). Two further works also draw on the author’s travels through these south-eastern European countries: the poetry collection »die ungerührte schrift des jahrs« (tr: The unaffected writing of the year), in which she returns to the world of her first novel, and the novel »Banatsko«, a declaration of love to the no-man’s-land between Hungary, Serbia and Romania. Her second collection of poems »Aufbruch nach Patagonien« in 2012(tr. Leaving for Patagonia), published a year later, is a collection of four poetry cycles titled »Naturschutzgebiet«, based on photographs she took of a derelict municipal park. This was followed by the novel »Am Fluss« in 2014 (tr. By the river). One of the arguments for awarding the author the Kranichstein Literary Prize in 2015 was its »captivating intensity«. Her »meandering explorations of the far reaches of the River Lea bring stories of unusual beauty to light«. Her most recent work »Karadag Oktober 13« (2015), which resulted from a literary conversation with the Scottish translator and writer Martin Chalmers and a trip to the Crimea. In 2009 Kinsky was awarded the Paul-Celan-Prize for her work as a translator, in particular for translating Tokarczuk’s novel »Unrast« (tr: Unrest). The author lives in Berlin and Battonya, Hungary, on the border to Romania.